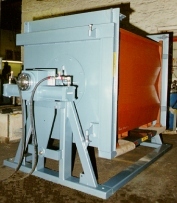 Low level inversion to either assist in the discharge of difficult products or for pallet exchange operations and product manipulation. Machines can either be ‘stand alone’ or incorporated into conveyor systems. Used either for inverting loads or for discharging contents into hoppers positioned directly underneath. Used also as repair stations when work is carried out on bases of containers.